So, I have a funny story about this property. A few years ago I had the opportunity to ride in a Wienermobile. I jumped at the chance, naturally (!). That day I suggested to the "Hotdoggers" (the college-age drivers of the Wienermobile) that when they went to Los Angeles, that they absolutely HAVE TO pick up my friend Allee Willis. I put them in touch and soon Allee was invited to take a ride too. She was thrilled. She asked Charles Phoenix, Mark Blackwell, and Susan Olsen, aka Cindy Brady, to join her. That day, Charles suggested they stop at the Brady Bunch house... with the Wienermobile... AND Susan Olsen! We thought we only had a half hour in the Wienermobile so we headed to Ventura Blvd., the street where we thought there’d be the most foot traffic so we could wave to the masses like beauty queens on a float. 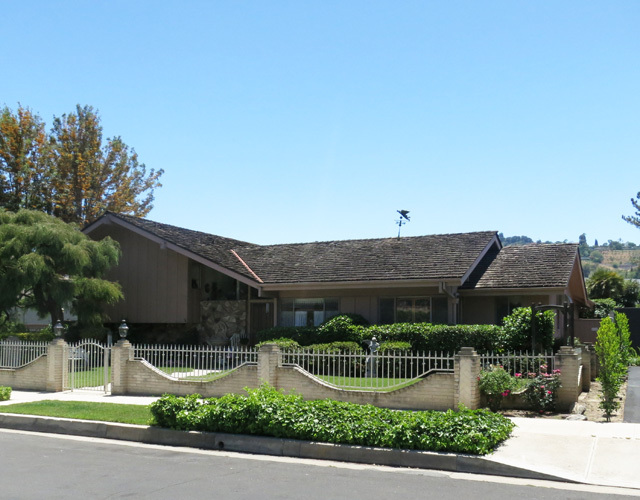 Charles mentioned that the real Brady Bunch house, the one used for the exterior shot that pops up in every episode, was probably only blocks away. Not only did I have no idea it was in the hood but Susan – an actual Brady – said she had never even seen it herself! How could this be??! Cindy-I-mean-Susan explained that as a wee star she couldn’t compute that a house that was clearly two stories... …was in reality only one. So the Wienermobile, a deceptively agile vehicle, whipped a U-ie and headed east toward Dillon St. As the top of the A-frame house poked into sight, we started going nuts. And we SO weren’t the only ones. There were already some sightseers there, dying that not only were they at the Brady house but now the Wienermobile had entered the picture AND a real Brady emerged out of it! Only God could have put a blessed tourist here at this moment. Can you imagine going to see the Brady house and the Wienermobile drives up and Cindy Brady pops out of it?! Photos of the exterior AND interior of the Brady Bunch house are available to view at its Zillow listing.